BiziChix websites will automatically add your logo or business name in the header of your website, which will appear on every page. You can choose to display your business name with text in a nice font, or your logo. See the two examples below, one with a nice font and one with a specific logo. Here are the tutorial steps of how to set both options up quickly! 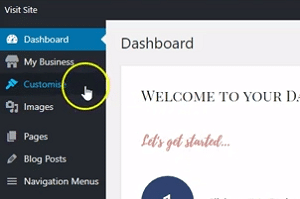 To change the default setting, click Customise in the Dashboard menu to go to the Customiser. Select Branding, then Logo. Then select your Logo Type. Choose Text in the Logo Type box. Then enter your business name in the provided field, click the blue Publish button at the top and you’re done. Click the X to close the Customiser. Choose Image in the Logo Type box, then click the Select image button that appears. You’ll see your image library. If your logo isn’t already here, you’ll need to upload it. 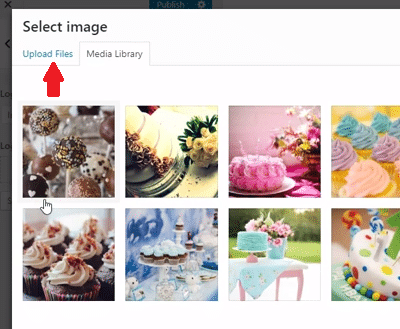 Click on Upload Files in the top left corner. 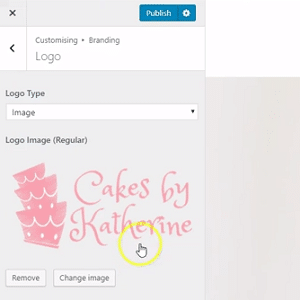 You can either click on Select Files to find your logo and upload, or you can simply drag and drop your logo file onto the page. Once your logo has uploaded you can select it, then click Choose Image button in the bottom right corner. 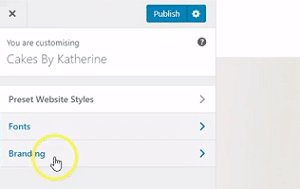 Your logo will now appear and you can click the blue Publish button to make your changes live. Click the X to close the Customiser.